Unitech's innovative and rugged PA968 mobile computer is designed for workers outside the four walls. Utilizing the built-in GPS tracking system with wireless capability, the PA968 can quickly and seamlessly transmit collected data to a server and enable tracking and tracing whenever it may be required. Data will be secure as the PA968 is equipped with a large memory capacity that can easily accommodate massive amounts of data without requiring any additional accessories. This versatile mobile computer scans 1D or 2D bar codes and features an integrated 500dpi fingerprint reader designed to authenticate a user's identity to protect privacy and confidential data. 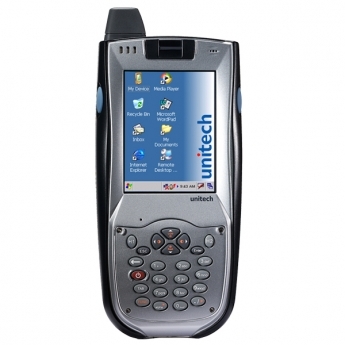 The Unitech PA968 also offers multiple customized applications through the embedded Windows CE 5.0 operating system, making it ideal for a wide range of applications in transportation logistics, law enforcement, or field service based enterprises. The PA968 also offers two intelligent and user-friendly modularized keypads, providing a more convenient and cost-effective solution for special keypad requests. To further address the needs of the modern mobile workforce, the Unitech PA968 features an ergonomically designed, ultra robust Aluminum-Magnesium alloy housing. Working its best in harsh environments, the PA968's durable construction is IP65-rated which protects it against water and dust, and withstands 5-foot drops to concrete. The 3.5-inch, high-resolution LCD will maintain outdoor readability even in high-sunlight conditions. In order to better serve today's mobility enterprise market, where time, efficiency and accuracy are of utmost importance, the PA968 offers a 2-megapixel color camera with LED flash, a large battery capacity, and the largest memory capacity in its class. The advanced performance features of the Unitech PA968 will deliver the superior reliability and execution needed when put in the hands of mobile workers.